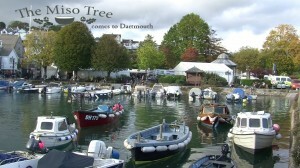 At the end of a gloriously sunny October it’s time for Dartmouth Food Festival once more but this year, as the crowds flock to the town, there is a completely new festival experience in store; Japan arrives! In the past I have joined in the Festival fun in lots of small ways; volunteering at the Information tent, skivvying for celebrity chefs in Kitchen Theatres, running errands for stall holders. Once I was even interviewed by the famous Matthew Forte about the merits of our Whiteface Dartmoor lamb! But this year is very different; I simply go to watch and learn. Six months ago our son, Tom, and his business partner, Noriko Kawamura, came over from Japan to help with lambing, huge fun for us and a steep learning curve for them! None of us had thoughts of the Food Festival. But you can never tell where a chance meeting and a cup of coffee may lead! 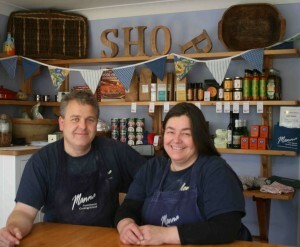 Nolly is a talented and experienced cook so I thought it would be fun to introduce her to my friends, Holly and David Jones, owners of the terrific Manna from Devon Cookery School in Kingswear, South Devon. David was Food Festival Chairman for many years and it is David and Holly who are responsible for the amazing success and growth of the festival. Coffee enjoyed, contact made, lambing skills accomplished, Tom and Nolly flew back to Toyota. Emails were exchanged; ideas and photos flew across the world, plans evolved. Tom contacted us and said he and Nolly would be over for the Festival. He mailed again, he’d be bringing a farmer friend as well; then again, there would be several colleagues from the Smiles Tokyo Restaurant chain. Another e mail, the Katsuobushi man and his daughter would be coming too, oh, and a photographer and his girlfriend; Japan was on its way. 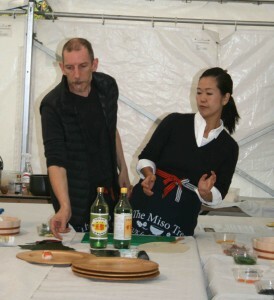 The festival began on Friday and the first sushi workshop had already sold out weeks before, Saturday’s too. Nolly taught everyone to make Temari Sushi: small spoonful’s of sushi rice are squeezed and shaped into a ball and decorated with all sorts of toppings. 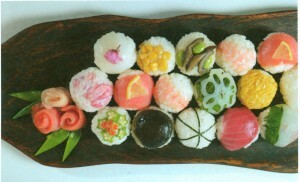 In Japan Temari sushi is made for the Girls Festival in March as a special supper treat. In the past dampened cloth was used to shape the balls but cling film is quicker and less messy. The rice balls are traditionally topped with raw fish but this time Nolly used smoked salmon, sweet corn, prawns, mange tout, nori or thinly fried Japanese omelette. There are no end of possibilities. The Cookery Theatre on Saturday proved to be a huge crowd pleaser too. Taizo Inaba, the Katsuobushi man held centre stage as Tom translated the story of bonito sentence by sentence! Taizo runs a wholesale company in Harumi, the Katsuobushi district of Tokyo near the famous Tsukiji fish market. He is one of the top traders in Japan and reputed to have a specialist eye for the fish; he can tell just by looking at a hard piece of dried, cured katsuobushi or bonito how the fish died and whether it suffered in trawler nets. He can tell when it was caught and how and whether or not it has been frozen. Fish that suffer in the trawler nets don’t taste good just as animals stressed at the abattoir release adrenalin which adversely affects the quality of the meat. Ninety nine percent of tuna is caught in trawler nets but Taizo will only buy line caught fish. 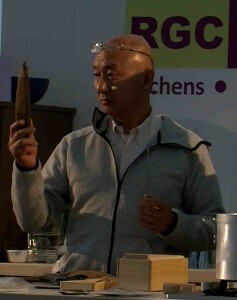 For thirty five years he has bought from the family of Makoto Miyashita who prepare the katsuobushi. First the fish is filleted, boiled and boned, then dried over a wood fire. Next the outer burnt layer is removed and the fish is reshaped. It is dried for three months coated, rather like cheese, in a layer of mould to prevent bacteria. The whole process takes six months. The finished dried bonito looks more like a piece of wood than a fish! A grater rather like a wood plane is used to grate the hardened blocks of fish into delicious flakes which can be used as a garnish on many dishes. But more importantly it is the essential ingredient in the famous Japanese stock, Dashi, the building block of Japanese cooking which forms the base of so many recipes including the ubiquitous miso soup. Dashi has been popular since the Edo period in Japan (1603-1868) when top quality konbu seaweed from Osaka and dried bonito from Tokyo first became available right across the country. The market stall run by the Smiles team looked wonderful too. They did a roaring trade each day but Sunday was amazing. 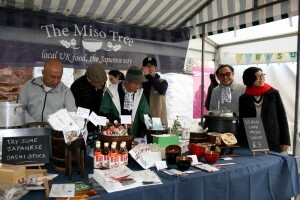 People flocked to buy the ingredients they had learnt about in the workshops and demonstration on the previous days and everything sold out! Sunday evening was time for a party at home to celebrate all the hard work that had led to the huge success of the weekend and the wonderful warm and enthusiastic welcome Japan had been given at the Festival! 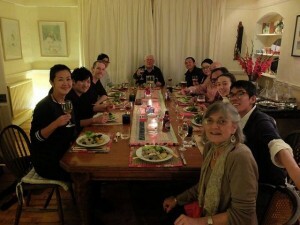 We all sat down around a huge table eating a fusion of English, French and Italian food! I cooked Orvieto chicken followed by Tarte au Pomme and finished with all sorts of European cheese. Tom’s head spun as he translated for the exhausted Japanese! All in all it was a tremendous weekend! Have a look at the slide show! slide show from Paul Vincent on Vimeo. Rinse the rice thoroughly in a sieve under running water. Put the rice into a heavy saucepan, cover with water, put a tight fitting lid on the pan and bring to the boil. Turn down immediately and simmer gently until the water is absorbed. Remove from the heat and allow the rice to stand for at least 5 minutes. Meanwhile dissolve the sugar and salt in the vinegar over a gentle heat. Put the freshly boiled rice into a bowl. 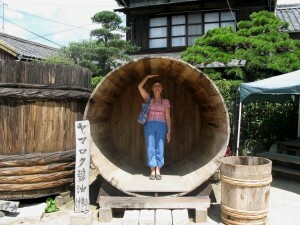 In Japan this is always a wooden bowl. Gently stir the vinegar mixture into the rice with a wooden spatula being careful not to crush the rice grains. Fan the rice with a Japanese rice fan or a piece of cardboard! Put a piece of cling film in the palm of your hand and place your sushi topping in the centre. Now place a golf-ball size amount of rice on top and squeeze gently into a ball. Remove the cling film and there is your Temari Sushi ball. Serve with a tiny dab of wasabi (remember it’s very strong!) and a dash of soy sauce. Delicious! Soy Sauce: Soy sauce is made from the fermented paste of boiled soya beans mixed with grain, either barley or wheat, and salt. It originated in China in the 2nd century BC and was brought to Japan by Buddhist monks in C7th. Here is soy sauce being made by the traditional manufacturer, Yamoroku on the island of Shodoshima in the Inland Sea of southern Japan. Place the konbu in a saucepan with 2 cups (500ml) cold water. Bring almost to the boil, remove the seaweed and throw in the dried bonito shavings; simmer for 8 minutes. Remove from the heat and let it stand for a further 8 minutes. Strain, allow to cool and store in the fridge. Use within a couple of days. Heat 300ml of dashi in a medium sized saucepan and bring slowly to the boil. Reduce heat and simmer for five minutes. Whisk in 2 ½ tbsp. good quality Miso. Miso is made from fermented soya beans. In Japan there are many different sorts of miso but here in the UK we must make do with what we can get. Avoid fancy flavourings and go for the most basic, if possible pure soya bean. Miso soup can have any number of things added to it; tofu, tiny mushrooms, potato matchsticks, dried wakame (seaweed). 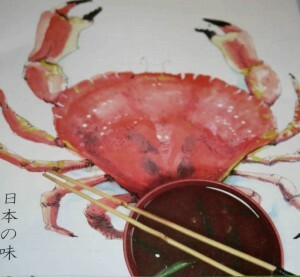 The possibilities are endless; experiment and enjoy this delicious traditional Japanese soup!